BUILDING FOR A COLD CLIMATE ideally means protecting the North side of the house - this earth sheltered home does a good job of that. In the winter, North facing windows are a prime source of heat loss. That's why there are only a few small one's here. They do contribute to cross ventilation in the warmer months. 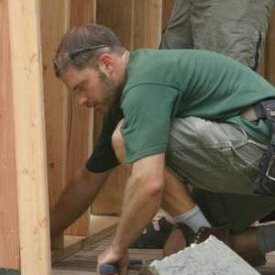 When Curt and Melissa hired Wagner Zaun Architecture to design a new home for their family, they had a clear goal: build a durable, adaptable home that uses as little energy as possible and has the smallest possible effect on the local and global environment. Designer Rachel Wagner brought in energy consultant Michael LeBeau of Conservation Technologies early to help achieve the project goals in the most integrated way possible. The history of collaboration between the two professionals combined with each firm’s strong commitment to sustainability and their experience with computer modeling of energy efficient homes well prepared them for the job. 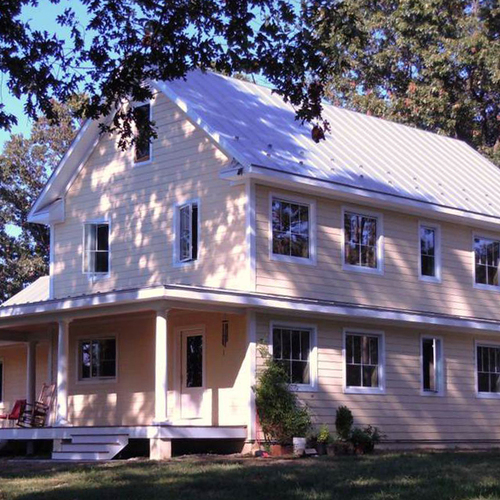 Their ultimate plan combined a heavily insulated shell with passive and active solar heating. 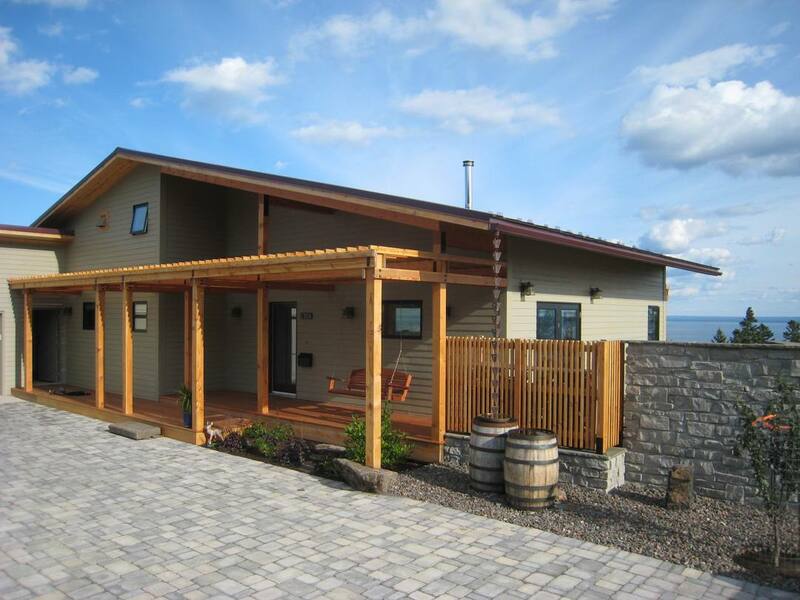 The narrow hillside and the commanding views of Lake Superior offered a solar orientation that was less than ideal, complicating the passive solar design. Fortunately, the sloped site also gives shelter to much of the home’s lower level. The team was careful to deal with the overall site and building design in an integrated, thorough manner, developing the overall site plan, roof forms and building orientation so stormwater runoff from the steep, in-town lot wouldn’t become someone else’s problem. The design team started by modeling potential building assemblies with a helpful software package called REM:Design, but then turned to the newly acquired Passive House Institute software (PHPP) to develop the design even further. 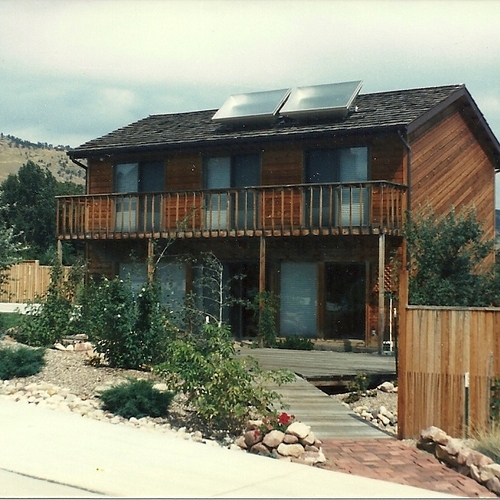 In the final energy model, the house did not quite meet the Passive House standard for heating (15 kWh/m2 per year – a difficult benchmark to reach in extremely cold climates). After construction, the blower door test result was 0.7 [email protected] Pa, a very tight house but also just over the Passive House air tightness requirement of 0.6 ACH @ 50 Pa. Nonetheless, the Passive House approach and software gave the team a very detailed and quantifiable method with which to improve the design. 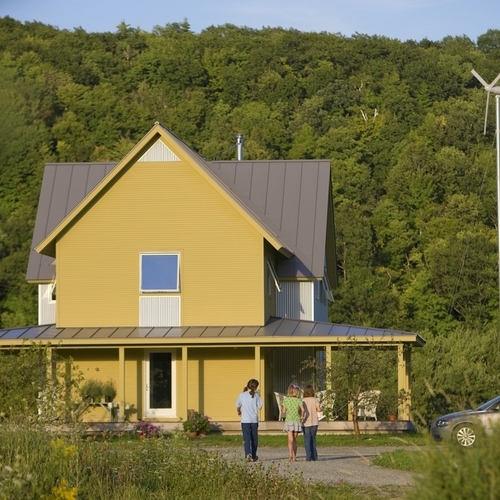 The home’s final design was estimated to use 75% less energy than a comparable home built just to code, and the initial data collected from the household energy consumption suggests that the energy model was accurate. Double 2×4 walls contain 14 in. of dense-packed cellulose with a cavity R-value of 53. 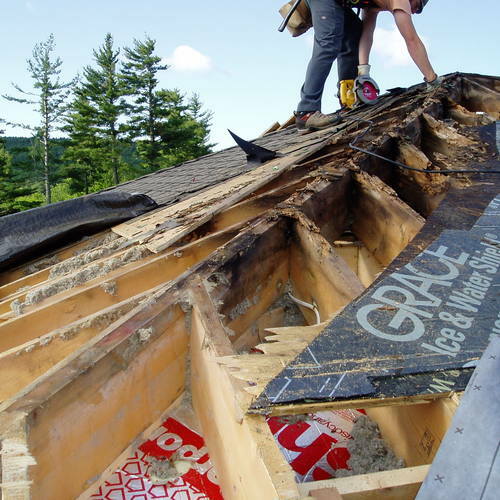 The roof has over 2 feet of blown cellulose and there’s a foot of XPS foam under the slab. With this much insulation, the windows are bound to be the weakest link in the thermal barrier, but with triple glazing, 2 low-e coatings, and insulated fiberglass frames, they do a respectable job. Plus the big south facing windows let sunlight pour onto a massive 13 ft. high concrete wall that stores heat well into the evening, and radiates it back into the house as needed. Although a good portion of the home’s heat comes from its passive solar design, there’s also an active solar thermal system that heats an 80-gallon domestic water tank before it redirects to a 275-gallon space heating storage tank. Local building codes requiring double wall heat exchangers for potable water caused Conservation Technologies to design the dual-tank system. An efficient modulating gas fired water heater backs everything up, but most of the family’s domestic hot water needs have been met by the solar thermal system so far. An outgoing coil in the big tank sends hot water through radiant tubes in the first floor slab and to a water-to-air heat exchanger in one of two main ventilation supply (HRV) ducts. 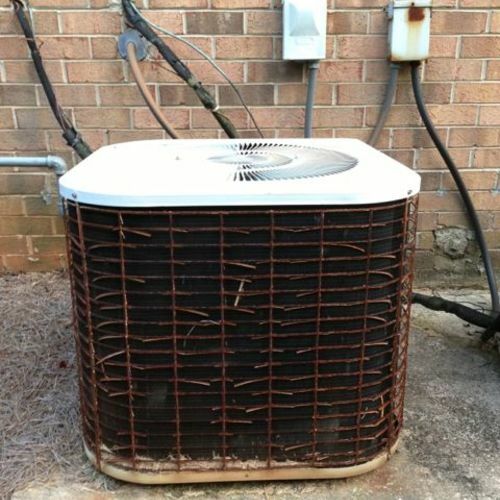 The heat exchanger (from the solar storage tank) only heats the ductwork for the upper level of the home because the ground level is taken care of by the radiant slab heat. 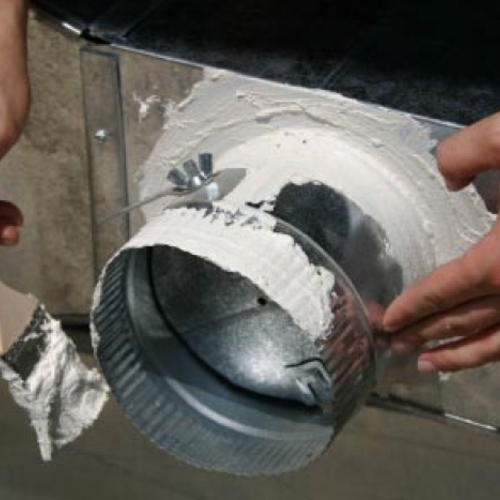 The concept of distributing heat through the residential ventilation ducting is popular in Passive House projects in Europe, but recent experience in North America and northern Europe has shown the mismatch between peak load heating requirements in very cold climates and the typically low air flows necessary for fresh air ventilation. The whole mechanical system is difficult to describe (see schematic diagram), but it takes no special effort to operate. Energy consultant Michael LeBeau commented, “It was an extraordinary example of integrated design.” Based on the first year’s energy data, the house is actually 80% more efficient than the average Minnesota home. Michael is hoping to install a multi-sensor energy logging system to better study and fine tune the HVAC and water heating components. 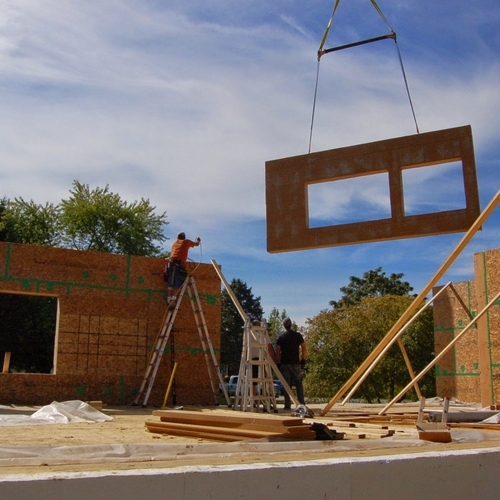 One of the biggest challenges in sustainable building is measuring success. Fortunately, the contractor put the extra time in to do a cost comparison of building the same home more conventionally. The premium was estimated at around 17% — not a bad investment when you factor in the long-term energy savings that go along with it. With its 13 ft. tall, 13 ft. wide concrete interior wall for thermal mass, the passive solar design works extremely well. As Rachel Wagner put it, “It was a beautiful thing to enter the house at 7:00 pm on a cold January day with the temperature around -7°F, to find the house at 70°F with no heat source running and the thermal wall still warm to the touch from the day's solar gain.” With many sunny days in January and February, the radiant heat was rarely used and the wood stove was barely used as well. 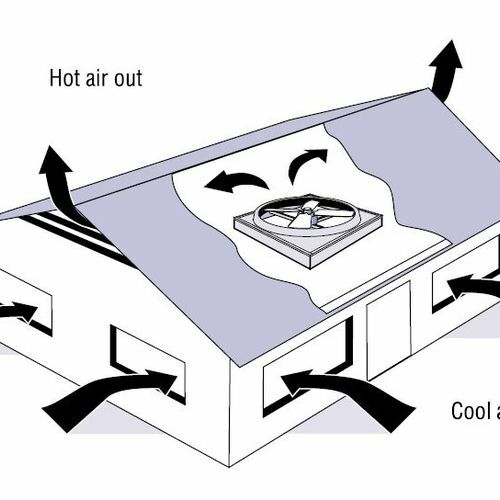 The attempt to distribute heat through the ventilation system drove the decision to install a larger HRV than required for ventilation alone. From this project and other research, the design team has decided to focus on simpler, smaller radiant-based heating approaches in future projects, keeping the mechanical ventilation system separate. 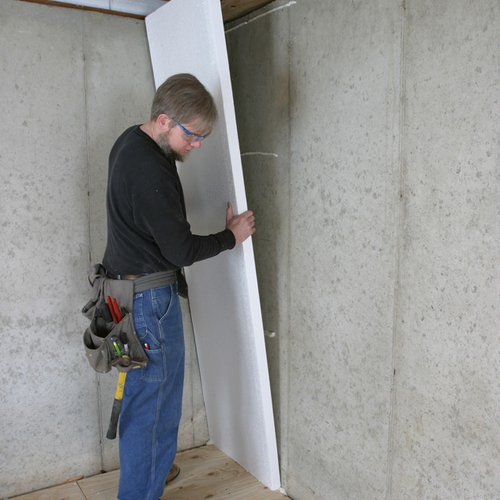 Where is the 13ft x 13ft thermal mass concrete wall? On the lower level? Is it sufficiently exposed to the sun to make a significant heating contribution? Is there a way to measure its effectiveness? Also, I've heard that passive solar action on radiant slabs can be problemmatic due to the heat gain messing with the temperature/feedback loop. Comments? “The thermal mass wall is 6" CMU (concrete block), solid core filled. It is about 13' long and 13' high and the face of it sits about 4'-0" from the inside face of the glazing. The largest expanse of south/southeast glazing is aligned with this thermal mass wall, so that it maximizes the direct gain from the sun in the winter. We did model the thermal mass wall in the PHPP software program; I can't say I know of any specific metrics associated with it, but anecdotally it seems to be doing a good job of storing heat on sunny days and releasing it at night. We did measure the temp of the wall itself on a very cold day with no sun and when the heating system was off and the mass wall was the same as the air temp at the time. The owners report feeling that the wall is warm to the touch at night after a sunny day.